Notes: The Catskill drys are a traditional pattern from the Catskill Region of Upper New York and were variations of earlier British Chalkstream patterns, particularly those of Frederic Halford. 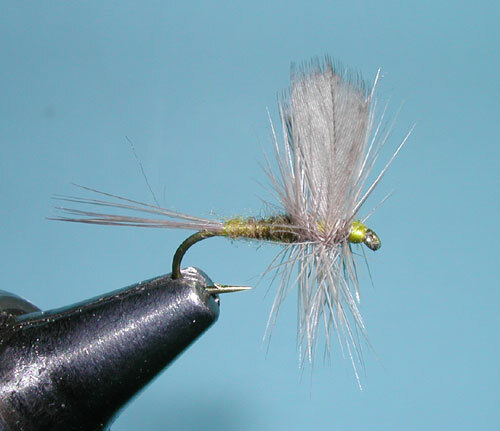 They represent mayflies with a hackle fiber tail, thin bodies, upright wings and hackle collars. The hackles were much stiffer than their British counterparts due to the more turbulent water of the Catskills. Our Wulff patterns became even more heavily hackled with thicker bodies for the larger Western streams. Early American fly tiers, such as Theodore Gordon, began this pattern in the late 1800's with his Quill Gordon. 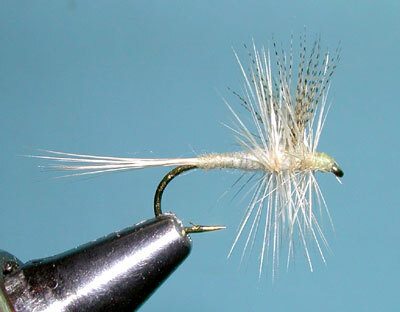 The pattern style was continued by Rueben Cross, who developed the catskill hackling technique of wrapping the hackle on both sides of the wing and was followed by Walt Dette and Harry Darbee in the 1920's. Catskill Drys are very effective in the smaller creeks and streams of the Sierra. 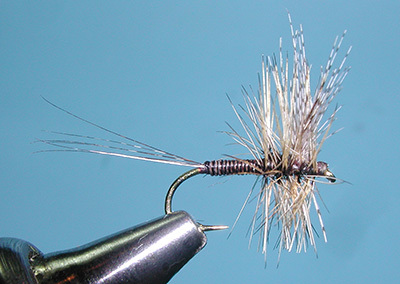 Probably the most famous Catskill Dry is the Adams which tends to be considered an attractor dry but also is a good choice for gray drakes and small gray duns. Important Catskill Drys for the Sierra are the Blue Wing Olive (BWO and Green Drakes), Light Cahill (Sulfurs and Pale Morning Duns) named after Dan Cahill, a railroad brakeman and an accomplished fly tier in 1880, whose pattern was modified by Theodore Gordon, Red Quill (March Browns and Mahogany Duns) created by Art Flick in 1933, and Quill Gordon. Quill Gordons actually do not reside within the Sierras (they are an Appalachian Mayfly). 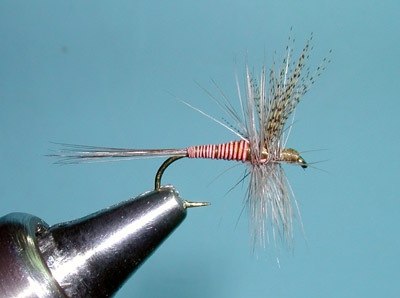 However, the pattern makes a great attractor mayfly pattern on Sierra streams and are similar to Mahogany Duns. These mayflies emerge on the bottom and will swim to the surface with it's wings out. A Hare's Ear Wet Fly does a good job in matching the emergent stage, using a Leisenring Lift to mimic the swimming action. 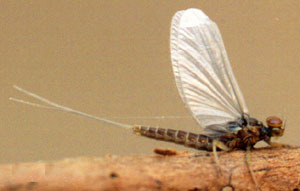 The dry flies represent the dun stage after the mayfly reaches the surface. 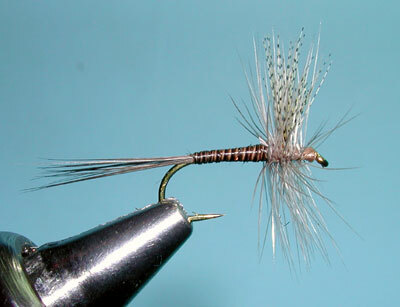 Often these duns get caught in eddies where the larger trout will hold anticipating an easy meal. Other promising areas are the feeding lanes at the lower sections of pools, trout will often hold in front of a boulder within this section sipping the duns as they drift to them. Presentation needs to be positioned from below the pool about 10 feet with a cast at least 2 feet above the boulder location. Hold the rod tip high to mimize drag. Many of the duns hatch during the midday when the water warms up. During the late afternoon, the mayflies will become involved in egg-laying and will become trapped within the water film as Spinners. Both Spinner patterns and the Catskill patterns will work during this time period. The Mahogany Duns (Paraleptophebia) will often hatch in the Spring (April and May) and also in the Fall (September and October) within the slow eddies when the water temps reach about 50 degrees. Our Sierra Mahogany Duns tend to be larger sizes of 12-16.